WASHINGTON — Federal drug agents have arrested more than 100 people across the country in the latest phase of a national crackdown on manufacturers and purveyors of synthetic drugs, the Drug Enforcement Administration said Thursday. The DEA and other state and federal agents arrested 151 people in 16 states since July 2014 in an operation that ended Thursday. Government agents also seized more than $15 million in cash and assets as part of Project Synergy, an ongoing DEA crackdown on synthetic drugs. Agents in Los Angeles and Bakersfield, California, seized about $500,000 in cash and more than 200 pounds of drugs, the DEA said. Several hundred people have been arrested since the agency’s first such operation in 2012. The DEA has been focusing on synthetic drugs, including bath salts, Spice and Molly, since the drugs gained widespread popularity years ago. The agency is responsible for enforcing federal drug laws. In late 2010, the DEA moved to ban five chemicals used to make synthetic marijuana blends, including K2, Spice and Blaze. Since then, illegal drug manufacturers have continued to modify their formulas and develop new chemical mixtures. 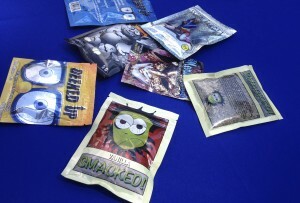 Reports of synthetic marijuana products identified by local, state and federal drug labs have skyrocketed since 2009. That year, labs reported 23 cases. Last year there were roughly 37,500.